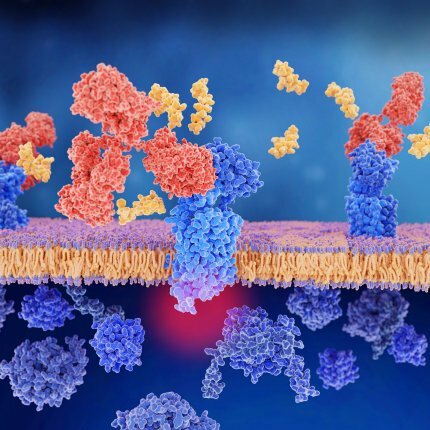 When a receptor is overactive — because of a drug or disease — the body attempts to normalize activity by internalizing the receptor, hiding it from molecules at the cell surface. Internalization is a key homeostatic mechanism. But a receptor’s degree of activation doesn’t perfectly parallel the subsequent internalization. Some ligands are “biased,” preferring activation over desensitization, or vice versa. Research from scientists at the University of Otago in New Zealand recently studied the bias of cannabinoids, including THC, anandamide, and 2-AG, at the CB1 receptor. 2-AG was about four times more potent than anandamide and 13 times more potent than THC in its ability to push CB1 inside the cell. The paper presents two models for studying internalization. The first is a set of experiments that determines the average time that CB1 spends on the surface of the cell, where it can be activated easily. The second is a more complicated theoretical model that interprets kinetics, the dynamic binding and release of a ligand and receptor. Kinetic models can also account for the availability of internal messengers and other aspects of cellular function. Though theory can appear esoteric, understanding such models helps when researchers are designing experiments or new pharmaceuticals. This study shows that measuring a compound’s affinity for CB1 should be done at multiple time points, otherwise the rate of internalization will confound the results. In other words, comparing the potency of cannabinoids at the same time will lead to artifacts in the data, since CB1 will internalize at a different rate in each experiment. From the perspective of drug design, these results suggest that THC is less likely to cause tolerance than drugs that block endocannabinoid degradation or transport. This is speculative, but in alignment current preclinical research.